It has been a good week for reading – just check out the stars for each one of these! And I would have a hard time selecting a favorite of these amazing books. Let me just say, if you want to choose an audio book, I highly recommend The Graveyard Book as an audio. Neil Gaiman’s voice for seven plus hours? Enough said. Saturday was a great day. A relaxing day, even. I had the chance to catch up with a friend while she highlighted my hair – covering as much grey as possible. J I caught up on Twitter. Drove to Champaign and back for groceries. Listened to an audio book. Made dinner. And it was in doing those last two items – at the same time – that I paused. Smiled. See, I was listening to The Graveyard Book, written and recorded by Neil Gaiman. I read the first twenty or so pages of this book when it came out back in 2008. I got through the man named Jack killing the parents, the sister, Bod heading for the graveyard. The mother, as a ghost, pleading with the ghosts in the graveyard to take care of her son. Jack, the murderer, stalking towards Bod and the ghosts. I got that far and slammed the book shut. At the time Luke was six, Liam was three. I couldn’t help but put them in the shoes of the children in the book. I just couldn’t read it. Several students over the years have read it, telling me it was a great book. I still hesitated. And then John Schumacher and Colby Sharp had to go start the Newbery Challenge – or Nerdbery – and I always looked ahead at this book, dreading it. How wrong I was. I LOVED The Graveyard Book. Loved Silas, the Owens, Bod – all of the kooky characters he meets. I was captivated by Gaiman’s reading of the book, absolutely perfect. (An aside, I kept picturing him as Silas. I hope when they cast the role of Silas in the film I’m not disappointed.) I am so grateful to #nerdbery and John and Colby for forcing me to read this. And as I finished this beautiful audio yesterday I was making dinner. Lasagna. Delicious. I hadn’t made lasagna forever – can’t remember the last time. Yesterday when catching up on Facebook and Twitter I had seen a post from Teri Lesesne that she was assembling several pans of lasagna yesterday for Easter today; I was inspired to make some as well. As I finished up making dinner – in tears – as my audio ended as well, I thought about both my book and my dinner. I had only given this book a second chance because two people I admire had challenged me to do so. I had changed my plans for dinner that night because another person I admire had made the same dish. While I’ve never had Teri’s cooking, I love the way she thinks. I saw her post, thought something like another good idea, Teri, wrote down the ingredients and was off. This made me pause; I’m thirty-nine years old and still influenced by the people around me. I still turn to them for advice, for recommendations. Do my students do the same? When holding some reading conferences on Thursday I often asked, Who do you get book recommendations from? Number one answer was me. And while I love that they listen to me, they still need to turn to each other. I’ve been working on this all year. John and Colby are my peers – Teri too. 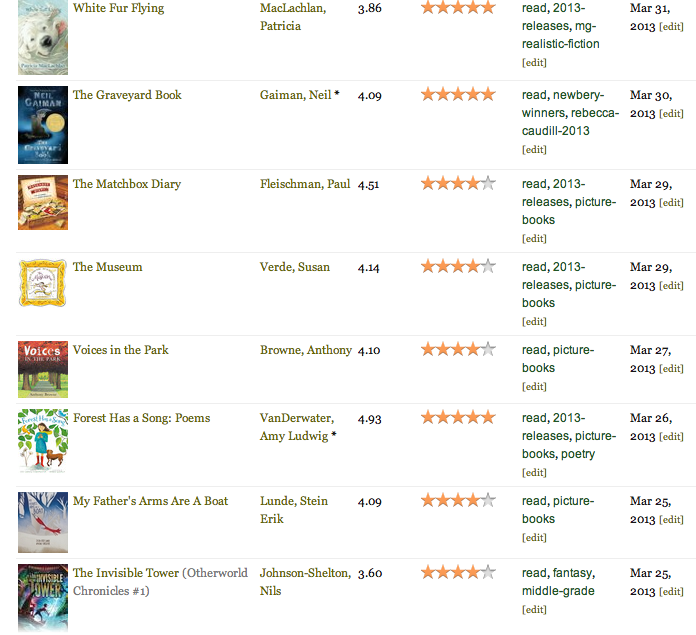 I want my students to see their peers as a source of book recommendations. Something I’ve been thinking about ever since seeing Donalyn Miller present material from her new book, Reading in the Wild. I think when I return to school on Tuesday I will share my experience from Saturday with my students. The idea of giving a book a second chance, and looking to our peers for recommendations – whether it is in regard to books or what you are having for dinner. Our role models are all around us. I’m glad I listened to mine. 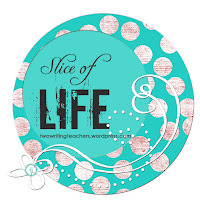 Slice of Life is sponsored every Tuesday by Stacey and Ruth from Two Writing Teachers. For the month of March we are challenging ourselves to write a Slice A Day. Tonight I was driving home from a fabulous dinner with some friends. We had been planning on and off all night the trips we'd like to take together. (If we could just get the time and money to work out!) At one point one of them pointed out that my 40th birthday is next year - where did I want to go to celebrate? I paused, and then said something about not needing anything elaborate. My fabulous sister-in-law, Mo, said something like, "We aren't going to some bookstore for your birthday, Katherine." I laughed. They know me well. Actually, some type of trip where I determine the path solely based on Independent Bookstores I want to visit sounds absolutely perfect to me. :) And as I sat down tonight to type up a slice, I thought of everything book related that has made me smile in the last two days. I graded some student responses this week - many students choose to do a short sketch and some writing as they think about their book. Loved these two. I know this is Carley, but this is how I looked upon finishing One for the Murphys. Loved the P.S. Note on this one. This students friends have been BEGGING her to read When You Reach Me. She loves it but wants to keep that a secret for now. The book & the experience belong to her alone. Reading Fortune Wookiee by Tom Angleberger with Liam before bed. Searching for the boys in the bookstore. Finding them happily reading a book together. And - no photo - but having them read facts about WWII to me as we drove to lunch. Love that they are excited about learning. Giving books to Miss Vivian when we met her for lunch. Love this line called Indestructibles! And those are just a few book related items that brought me some joy. I thought as I drove home from dropping my friends off - I know they were teasing about the bookstore trip (although I wouldn't be against it, ladies!) but I'm glad that being a lover of books is so woven into my identity that when thinking of where I'd like to go, that's what came to mind. I'm happy to wear this Nerdy Book Club badge with honor. There are much worse things I could be known for, books sounds about perfect to me. When I was growing up, I knew I wanted to be a mom. I also was absolutely certain that I would be a mom to boys – three, in fact. When I was pregnant that first time and we had the ultrasound, the doctor announced it was a boy, and I wasn’t surprised at all. Three years later we were expecting again. People asked what I “wanted” – as if I had a choice in the matter. I always said I wanted a healthy baby, which I truly did, but I was thrilled to find out we were having another boy. I remember my irritation when people would ask if we were going to “try” for a third so we could have a girl. I love my two boys, if we planned on another child, it would be to have another child – not to fill a void in gender. And I know we’re lucky. We’re perfectly happy with what we are blessed to have. I also think God knew what he was doing – because honestly, boys are much easier for me to raise than girls. Girl drama kills me – I have seen enough of it over the years as a teacher. I am not a fan of heading to gymnastics or cheerleading. And I enjoy boy humor. Don’t get me wrong, I adore my students that are girls. I feel blessed that I am part of their lives. But coming home to conversations like the one below make me realize, I am exactly where I am supposed to be. Liam has been “raising” a Peep at school all week. 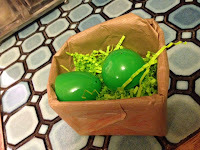 It is his “child.” His peep has a name, but he calls it “Peepy.” I have heard about Peepy all week – what Liam has done with him, what he was going to read him, etc. We even made Peepy a bed. Tonight Peepy was coming home to live here. 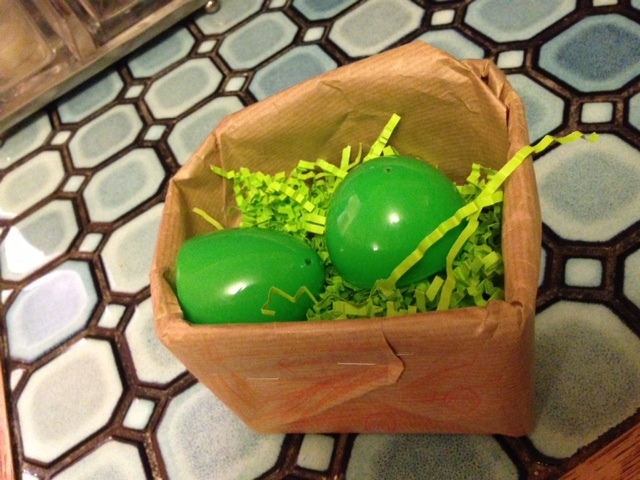 I walked through the dining room and saw the box, no Peepy. I walked into the family room. Laughter. Lord I love my boys. Slice of Life 20 - What does "NERD" mean? Slice Six - What does the future hold?